A man who has chosen a vasectomy needs to know what will happen during the procedure.The following description can help to explain the procedure to him. Learning to perform a vasectomy takes training and practice under direct supervision.Therefore, this description is a summary and not detailed instructions. The provider uses proper infection-prevention procedures at all times (see Infection Prevention in the Clinic). The man receives an injection of local anesthetic in his scrotum to prevent pain. He stays awake throughout the procedure. The provider feels the skin of the scrotum to find each vas deferens— the 2 tubes in the scrotum that carry sperm. 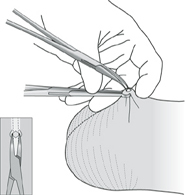 Using the no-scalpel vasectomy technique, the provider grasps the tube with specially designed forceps and makes a tiny puncture in the skin at the midline of the scrotum with a special sharp surgical instrument. Using the conventional procedure, the provider makes 1 or 2 small incisions in the skin with a scalpel. The provider lifts out a small loop of each vas from the puncture or incision. Most providers then cut each tube and tie one or both cut ends closed with thread. Some close off the tubes with heat or electricity. They may also enclose one end of the vas in the thin layer of tissue that surrounds the vas (see Vasectomy Techniques). The puncture is covered with an adhesive bandage, or the incision may be closed with stitches. The man receives instructions on what to do after he leaves the clinic or hospital (see Explaining Self-Care for Vasectomy). The man may feel faint briefly after the procedure. He should stand first with help, and he should rest for 15 to 30 minutes. He usually can leave within an hour.